The name Steve Rivera might not be one that you’re familiar with - yet! - but I predict that that will change shortly! 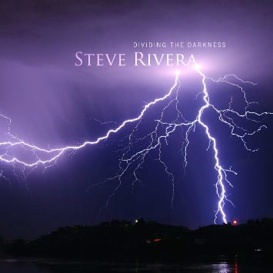 Steve released an excellent album called Dividing the Darkness last year that was one of my Favorites for 2015. The album was produced by Will Ackerman and mixed and mastered by Tom Eaton. It features piano plus other instrumentation by some of the outstanding artists that work with Imaginary Road Studio. I met Steve when I was in Southern CA in January, and was able to spend some time getting to know him. His upbeat personality and positive nature are infectious, as you will be able to tell from this interview. I’d like to introduce Mr. Steve Rivera! KP: I really enjoyed meeting you and getting to know you a bit during the NAMM/Whisperings weekend the end of January (2016)! Click the album cover to read Kathy's review. SR: It was great to spend time with you. Not only do you do so much for music, music is part of who you are and you are a fantastic human being. I consider it a privilege to have spent time together. They say music enriches people’s lives and you are a testament to that. KP: Thank you! Your “official” debut album, Dividing the Darkness, was on my Favorites list for 2015 and it sounds like it’s doing well on the various music charts. SR: I have been so fortunate already with Dividing The Darkness, and for it to be listed as one of your Favorites for 2015 is such an honor. There are so many great musicians on your list, and to be included with them - Wow! KP: What was the inspiration for the music on the album? SR: There are so many things that have inspired the music. Like most people, I have had a lot of challenges in life and have thankfully been able to get through them and become a better person. I have been shown that I cannot force an outcome in life. When I keep my meddling hands out of the outcome, everything seems to work out. No matter what your religion or philosophy is, there is no mistaking that life is random acts strategically planned. My two daughters are always an inspiration. I consider myself extremely fortunate to be an active part of their daily lives. Life itself is an inspiration, but how it inspires my music really depends on what my thoughts are at the time and why I sit down at the piano. Sometimes I have a melody floating around. Other times I have time to sit down and just play. I try to actively realize how fortunate I am despite life’s drastic ups and downs. KP: Since it’s been several months since I reviewed Dividing the Darkness, I have been listening to it the past few days and am blown away all over again. The album has a really nice balance of lighter, happier music and some that is darker and more intense. Great stuff! SR: I am so glad to hear that. I refer to the music on this album as “restrained simplicity that is emotionally moving.” Most of the album is reminiscent of life. Sometimes we go through more intense, dark times and other times we are elevated to the heavens. I think, as you say, this comes through in my music. 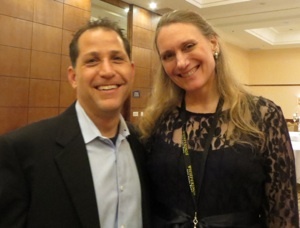 Steve with Rebecca Oswald at Whisperings in Costa Mesa, CA. January 24, 2016. SR: “This Ancient Road” is a song from The Parable, the musical that I am writing. The song title is symbolic of how many people, despite the consequences, trudge forward, to stay true to their integrity and loyalty despite the cost. “Delicate Force” is exactly what the title says. The vocals by Noah Wilding, the percussion by Jeff Haynes, and Tom Eaton’s work help to bring this to life. I believe the song has a delicate forcefulness that drives it throughout. KP: What made you decide to contact Will Ackerman at Imaginary Road Studio to possibly produce the album? SR: When I was ready to record my album, I thought “who would be the best to help me do this?” I knew I wanted not just piano but additional instruments, so the best producer would be Will Ackerman. KP: I’ve always been curious about the recording process with an ensemble of musicians. I know not everyone does it the same way, but did you record the piano parts first and then the accompanying musicians? SR: I don’t want to give away the creative process that Will Ackerman and Tom Eaton use to put together an album, but we recorded the piano first. Artists often need to record tracks several times before they nail a song, but because of Will, Tom and the set-up at Imaginary Road, I felt extremely comfortable and three of the songs on my album were done in the first take. (Will talks about this in my video on YouTube.) Knowing that we were recording other instruments, I purposely left room for them in the songs. My primary purpose was always more about the overall quality and integrity of the music. I think this is evident in the album. 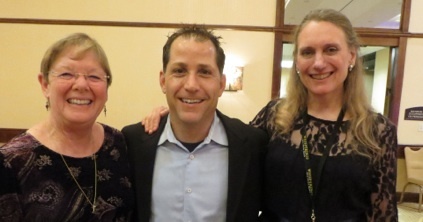 Kathy, Steve, and Rebecca at the Whisperings Dinner, January 24, 2016. KP: Did you have parts written out for the other instruments or did the musicians do their own interpretations? How much input did you have about the accompanying parts? SR: Will, Tom and I had a very good idea of where we wanted to go with the music, so we had a lot of input. The other artists were pretty open to any directional changes, but all of the musicians on the album are award-winning artists. As a matter of fact, almost everyone involved with my album, besides me, has won Grammys. I wanted them to have the room to use their amazing talents, and I believe it shows. To my surprise (since I am always so critical of my music), the musicians all responded very positively to my music. They often sat for some time after recording, engulfed in the feeling and mood of the songs. KP: Did you do much improvising in the studio? SR: That’s almost a yes and no answer. While I had most of the songs completed in their entirety, I left room for emotion and movement. However, I wrote one of the songs on the spot. Would you like to know which song that was? KP: Sure! Tell us about it! SR: I wrote, “So Quickly Gone” in the studio with some input from Tom Eaton. Will liked the song so much he wanted to play guitar on it. On the album, at the end of “Skyward Coda,” there is a break of about 23 seconds and then you hear some distant-sounding piano with what sounds like voices and birds. That part of the song is completely unedited. We were waiting for one of the musicians, so I went in and started “goofing around,” improvising on the piano. To my surprise, Will and Tom decided to record it. When we played it back later, we were amazed. The reason the piano sounds so distant is because it was. The mic was in a different room about 35’ feet away. If you listen closely you can hear birds chirping. Those are actually birds from outside. At times, it also has the faint sound of vocals. That is actually the wind. We all liked it so much we decided to use it as a bonus track. KP: It’s a beautiful ending to the album! Let’s talk about your background a bit. Where were you born and where did you grow up? 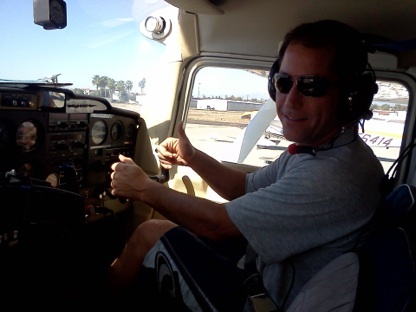 SR: I was born in Burbank and grew up in Southern California - mainly Huntington Beach, Tustin and Corona. KP: When did you start playing the piano and when did you start taking lessons? SR: I have been around music my whole life. My Dad often tells a story that when I was about 4, I wrote a song on the piano called "Daddy's Home." My parents tried to give me lessons when I was about 8, but I was more interested in riding my bike, surfing, skateboarding, etc. My first piano lesson was actually in college. KP: Do you have any brothers or sisters? SR: Yes. I have two younger brothers, Tony and Danny (I had an older brother, Robert, who passed away in 2010 unexpectedly). KP: Are any of your family members musicians? SR: My grandpa was a musician, my dad plays, and my brothers also have musical talent. My brother, Tony, plays the piano and guitar. KP: Are you mostly classically-trained or did you get into jazz and rock as well? SR: I am classically trained. In college, I majored in Composing and Conducting. Per course requirements, I also took piano with one of the department professors and had do to quarterly graded recitals. That was nerve-wracking! You walk into a room with all the music department professors, who have clipboards in hand to grade your performance. KP: Pressure! Do you play any instruments other than piano and keyboard? SR: I can play guitar and bass, but not proficiently. KP: You actually recorded an EP quite a few years ago that was sold and played in Nordstrom stores around the country. Did you play in any of the stores? SR: Yes, I was fortunate enough to have a solo piano album called The S Collection that was mostly contemporary with a couple of classical-sounding songs. I performed at several Nordstrom stores throughout Orange County and Riverside, usually about four hours at a time at each store. KP: You told me that before you started doing music full-time, you worked for an ice hockey team. Which team and what did you do? SR: Yes. I quit school and piano because I had the opportunity to work with the LA Kings. It was fantastic. I went to my first hockey game in about 1990 and fell in love with the sport. 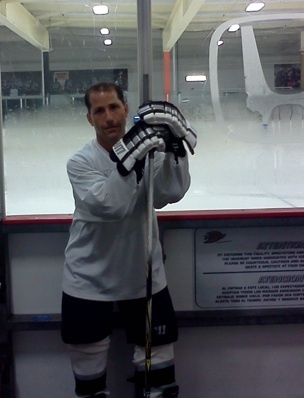 I had never even ice skated, but I decided I wanted to start playing. About a year later, it was announced that a pond was being built for The Anaheim Ducks, and I decided that I wanted to work for them. I wanted to be in the thick of the game, in the locker room and on the bench, so I thought I could be an equipment manager. At that point, I started volunteering for the club and when the position opened the following year, I was offered the job as an assistant equipment manager. I was with the team from 1992-1996. KP: And you still play ice hockey? SR: Yes, I actively play at least once a week. KP: Are you working on your next album yet? If so, do you want to give any hints or teasers about it? SR: Absolutely! I have completed about ten songs and am working on a few more ideas. It will be another piano-centered album. The songs are varied in style, which I think is great, and I might include a few songs that have a more classical feel. KP: I can’t wait to hear it! You work part-time at Kim’s Pianos in Stanton, CA where a few of the Whisperings concerts have been held. Do you do mostly sales there? SR: My longtime friend, Mr. Benjamin Kim, owns the stores. After he opened their flagship showroom, he kept asking me to come in. I had been in piano stores before so I wasn’t really excited about it. However, when I did go in, I was absolutely impressed. Kim’s is one of the biggest piano stores in the nation. At any given time, they have over 180 pianos, and almost any brand of piano that you can imagine. We had a long discussion and decided that with my background, as well as being a professional musician and a teacher, I could bring a lot to the store. My primary objective was marketing and being involved with the community, which we have done successfully. Along with Mr. Raymond Lee, we coordinate all the events at the store, including the Whisperings concerts that we’ve hosted the last two years. There are several pianists that we work with regularly and we do whatever we can to accommodate and facilitate concerts here. And yes, I do help with sales too. KP: And you also have a regular gig at an upscale restaurant in Dana Point, CA? SR: I absolutely love that gig! It’s great to play somewhere regularly and I have the opportunity to try out my new music as well as playing my older original songs. I can get direct feedback, which is invaluable. KP: Do your daughters have any interest in music? 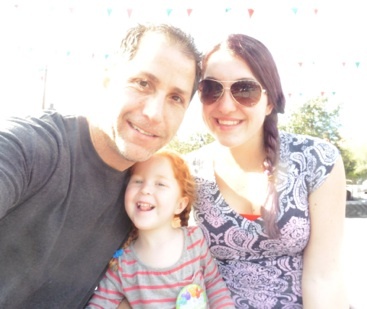 SR: I have two amazing daughters, Rachel and Samantha, and I am so fortunate to be their dad. When my older daughter was in school, she was in theatre and had several performances. She went to Cal State Fullerton and planned to major in theatre, but then she decided she wanted to work in the medical field. My younger daughter, Samantha, has been taking piano lessons for about six months and has a huge interest in musical theatre. She has seen over twenty Broadway shows and has performed in four different productions. She is currently in dance and has had several recitals. She is already making up songs, too! KP: Sounds promising! Who do you consider to be some of your musical influences? SR: My musical influences are all over the place. My dad plays oldies, blues and jazz, so I grew up hearing that. The first songs that I played were a boogie-woogie and “Colour My World” by Chicago. In my teenage years, I used to intentionally fall asleep watching Amadeus or listening to Mozart's Requiem, hoping that they would penetrate to my sub-conscience and influence what I write. SR: Easily Mozart and Beethoven. KP: What has been your most exciting musical moment to date? SR: Back in 2006 and 2007, I wrote for three different musicals for the Golden State Theatre Company that were performed at The La Mirada Theatre for the Performing Arts. One was an original show about the Circus called Under The Big Top. For that musical, I wrote everything but the actors’ dialogue. The second night, I sat in the balcony just watching people’s responses to the music. It was exciting! SR: My first wish would be for more wishes. I would absolutely wish for the continued health, well-being, happiness and fulfillment for my daughters. 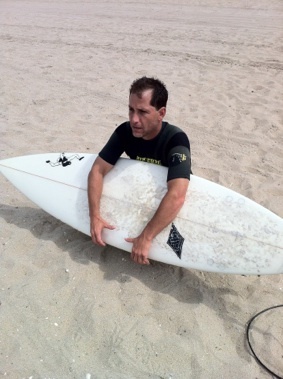 SR: Well, besides ice hockey, I enjoy surfing, reading and the theatre. KP: What do you like to do in your free time - if you even have any! SR: What’s free time? I enjoy playing piano and working on new material. It is always nice to just relax and do nothing, but I usually feel guilty because I feel pressured to accomplish stuff like my new songs, my musical, and I’m writing a children’s book. KP: Is there anything else you’d like to share? SR: I am humbly grateful for the opportunity to share my music with people and to have them experience emotions from my music. I am extremely open with people beyond just surface interactions like "how's the weather." I truly enjoy the experience of communicating and connecting with people on a real level. I try to do the same with my music. To me, being a musician is about being able to put feelings, emotion and expression into music that others can relate to and that transcends verbal communication. In short, my musical goal would be to create music that will ultimately have a positive impact on people’s lives for the betterment of us all. Many thanks to Steve Rivera for taking the time to chat with us about his life and music! 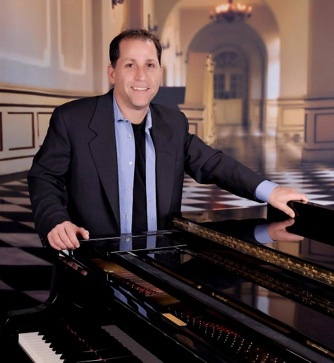 To learn more about Steve, be sure to visit his website as well as his Artist Page here on MainlyPiano.com.